This is probably the strangest use of cauliflower I have tried yet, but, it worked! The cauliflower-lentil combo was surprisingly tasty. We all ended up making tortilla-less salad combos with it after eating a taco or two. 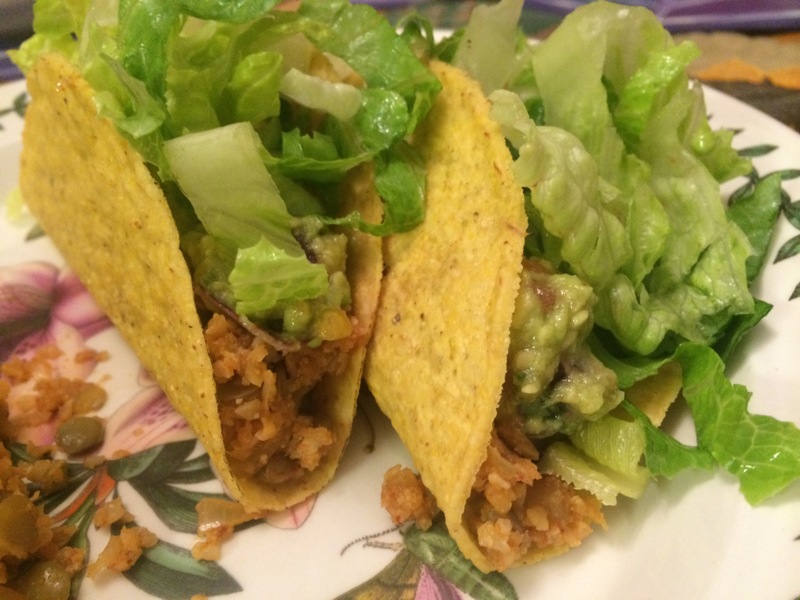 It easily replaced beef and refried beans and was more flavorful and oh so healthy! In addition the leftovers made a really nice lunch the next day, heated and topped with some lettuce and feta. Adapted from Jason Andrew Wrobel on Cookingchannel.com. Rinse the lentils and drain well. Combine the lentils and 3 cups water in a small saucepan. Bring to a boil, then reduce the heat to low and simmer until tender, about 30 minutes. Drain of excess water and set the lentils aside. 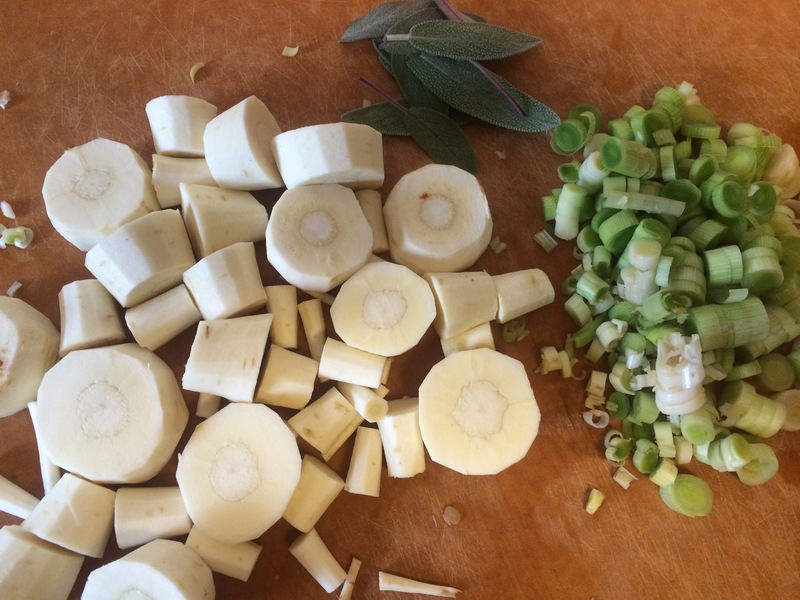 Pulse the cauliflower in a food processor or blender until reduced to pieces the size of rice grains. Heat the olive oil in a large skillet over medium heat. 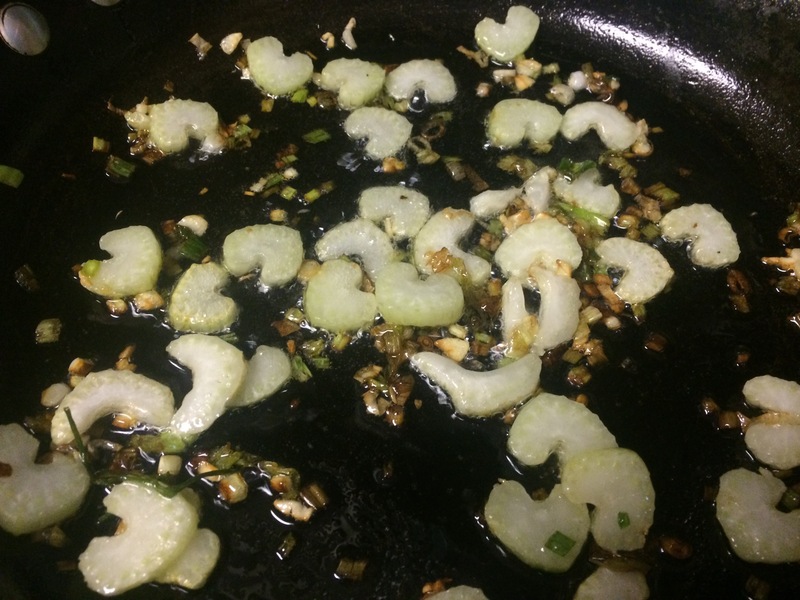 Add the onions and jalapenos and cook until the onion is translucent, 5 to 7 minutes. Add the cauliflower, garlic, 2 teaspoons of the chili powder, 1 teaspoon of the cumin and 1/2 teaspoon of the coriander and cook for 4 minutes. Stir in the tomato sauce and cook until the cauliflower is tender, another 3 minutes. 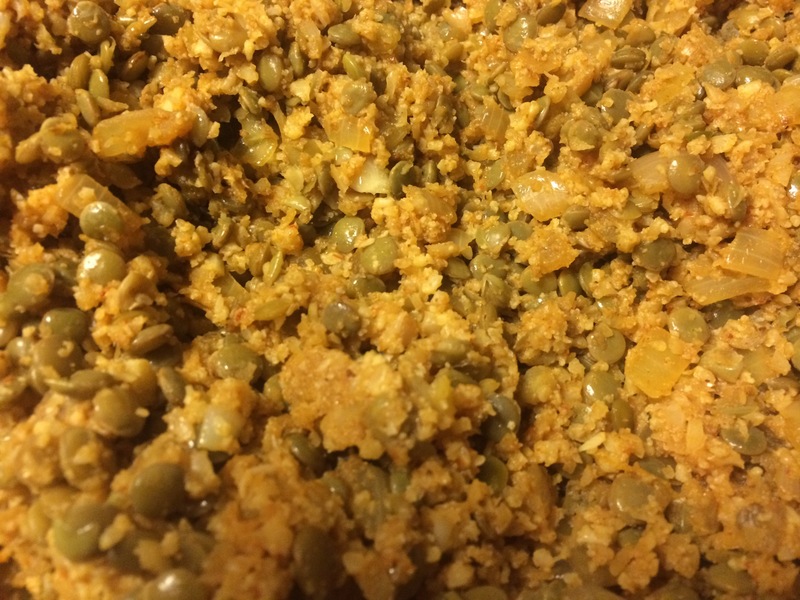 Add the cooked lentils to the cauliflower mixture. Add the remaining 2 teaspoons chili powder, 1 teaspoon cumin and 1/2 teaspoon coriander. Stir in the salt and pepper and cook for 3 minutes more to blend the flavors. Taste and adjust seasoning if necessary. Scoop the taco filling into taco shells, top with some shredded romaine and a dollop of guacamole. Serve immediately and enjoy! Serves 6 – 8. Ah, good ol’ swiss chard. Yes, it has been growing in the garden all spring, summer, and now fall. I got so tired of it by early summer, I pulled all but 2 of the plants and have been lopping them off every now and then. But, there is no killing swiss chard (at least in my garden). But now that all my other, more interesting, plants have wound down, it is nice to have it there to use again. I am actually curious as to how long into the year the plants will keep coming back. My garden is fairly sad looking right now. I cleared out all the non-producing plants, so all that is left is: Swiss chard, lima beans, jalapenos, some kale I am hoping to revive, 1 tomato plant, and the jerusalem artichokes, garlic and strawberries waiting for next spring. It is so ‘not pretty’ that I will not include any pictures of it. But, back to the chard. 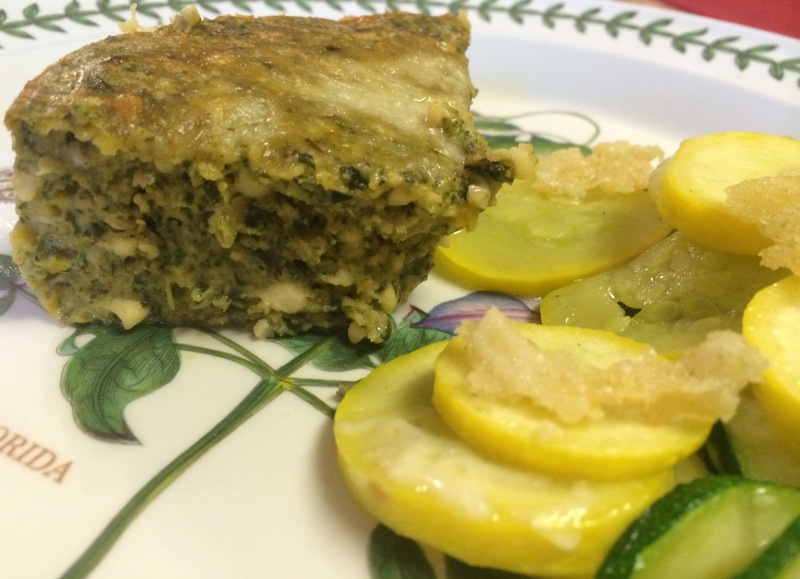 I decided to try something different…a swiss chard cottage cheese puff. 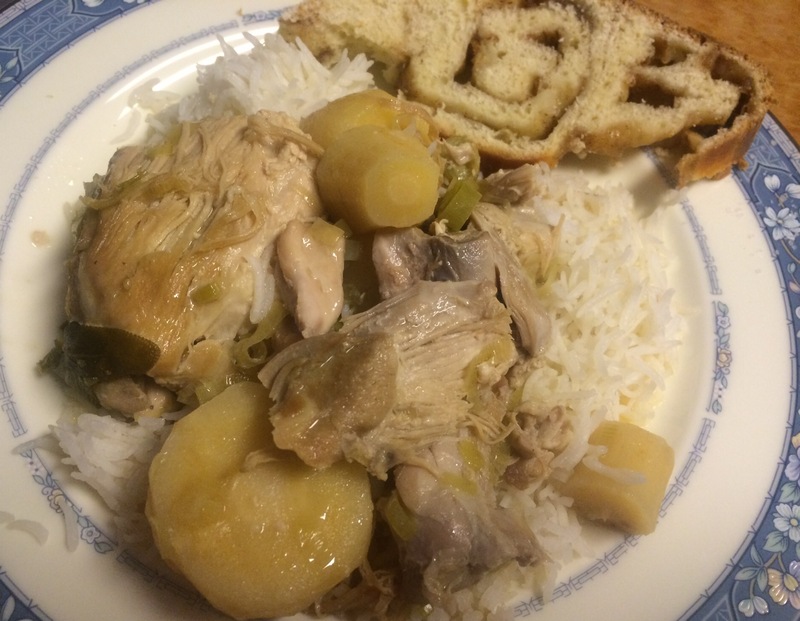 What a great group of ingredients went into this… The dish was surprisingly flavorful and filling. The 1 quart casserole easily fed the 4 of us. Heat oil in a large skillet over medium heat. Add garlic, scallions and celery and saute until very tender. 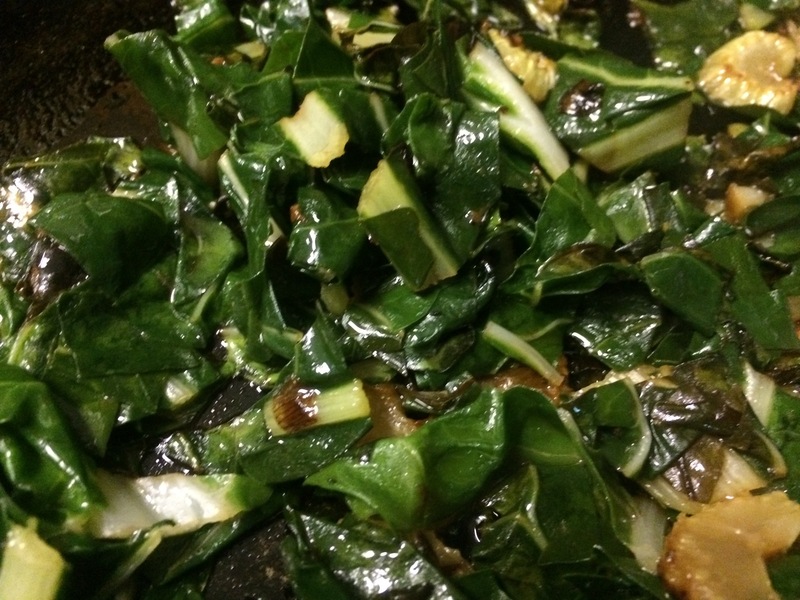 Add swiss chard and a few tablespoons of water. Steam, tightly covered for 3 or 4 minutes, until chard is wilted and tender. Remove from heat and puree in a blender. 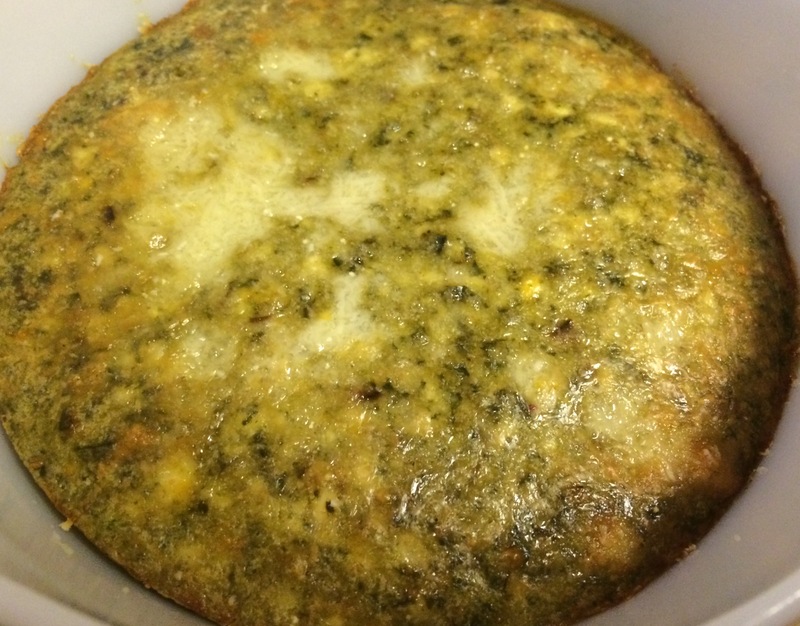 Combine mixture with the cottage cheese, flour, eggs, and cheddar and beat until light and fluffy. Preheat oven to 350F. Coat a 1-quart casserole with cooking spray. Sprinkle with 2 Tbsp parmesan. 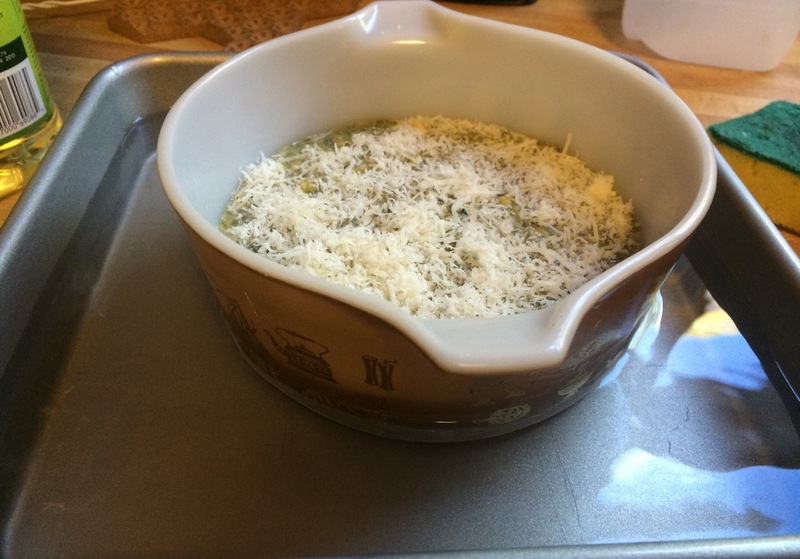 Pour in mixture and sprinkle top with remaining 2 Tbsp parmesan. Place casserole in a pan and pour hot water into the bottom of the pan until water reaches halfway up the sides of the casserole dish. Bake for 1 hour or until puffed and golden brown. Serve immediately. Enjoy! Serves 4. Time to really shift gears into the fall harvest. It was a very good year for sweet potatoes. 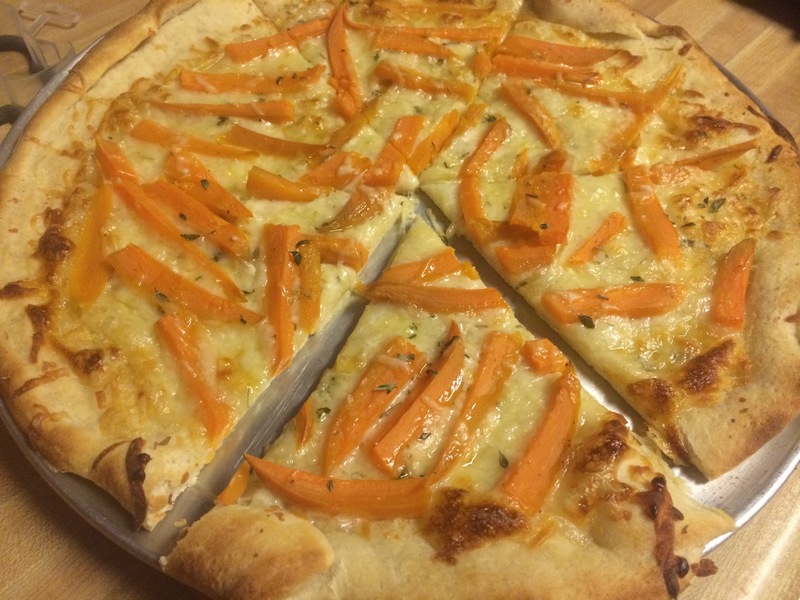 My first ode to the sweet potato – a white pizza with sweet potato as the topping. Scrumptious! And I am not usually a fan of white pizza, but I loved this. Preheat oven to 450F. Grease a 12-inch pizza pan. Peel and cut the sweet potato into 1/4″ slices. Cut each slice into 1/2″ wide strips. Place in a microwave safe dish, add water. Microwave, covered, on high for 3 – 4 minutes or until potato is almost tender. Drain, sprinkle with salt and pepper. Unroll and press dough to fit the pizza pan. Sprinkle with mozzarella and swiss cheeses; drizzle with 1 tsp olive oil. Top with sweet potato; sprinkle with herbs. Drizzle with remaining 1 tsp olive oil. Sprinkle with parmigiano reggiano. Bake on lowest oven rack for 12 – 15 minutes or until the crust is golden and cheese is melted. What is still growing well in my garden? Parsley! The plants look beautiful and healthy. This pesto uses parsley and toasted walnuts in place of the basil and pine nuts. 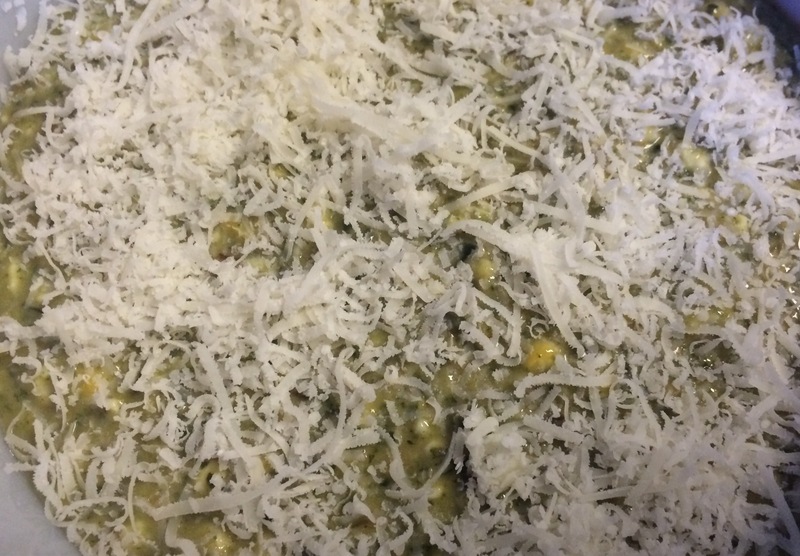 Otherwise, it is basically the same recipe as basil pesto. 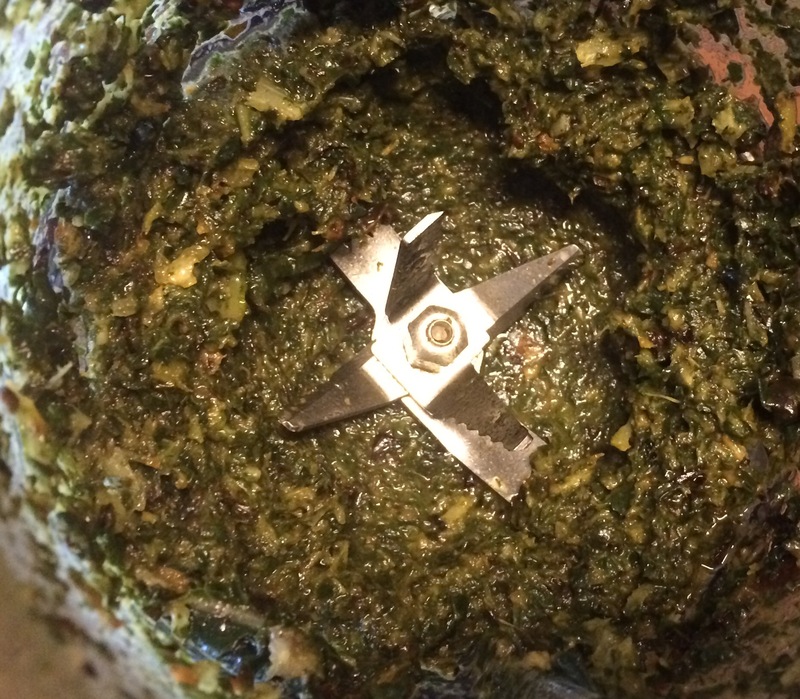 The pesto has a stronger, sharper flavor; it was excellent. 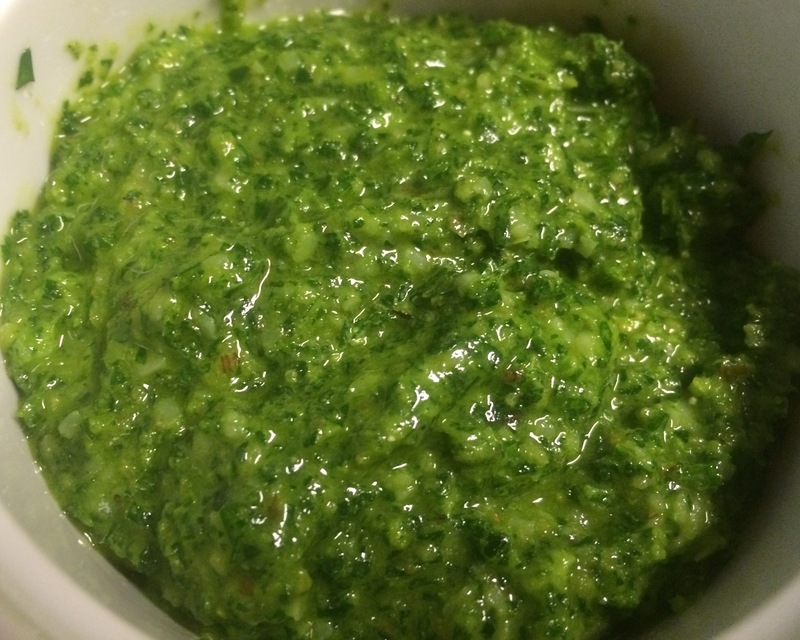 Place the parsley, garlic, walnuts, salt and pepper in a food processor. With the processor running, add the olive oil. Add the cheese and pulse until well combined. 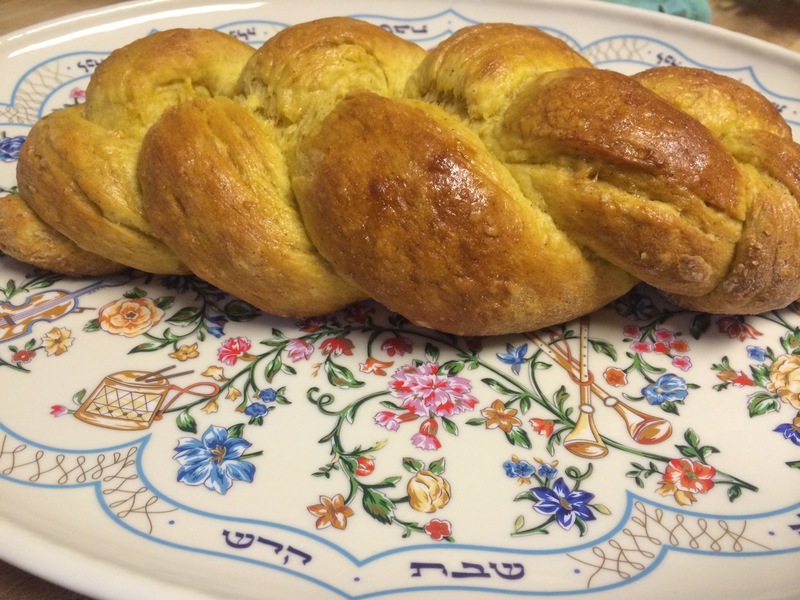 What better way to celebrate autumn and Shabbat during Sukkot than with a pumpkin challah? It gets its beautiful yellow-orange color from this pretty combination that gets mixed into the dough. It was great, just enough pumpkin pie flavor to make it interesting, but not so much that it distracted from dinner. But…we can’t wait to use it in French toast. THAT will be amazing! Cover bowl with a towel and leave until frothy and risen, about 20 minutes. 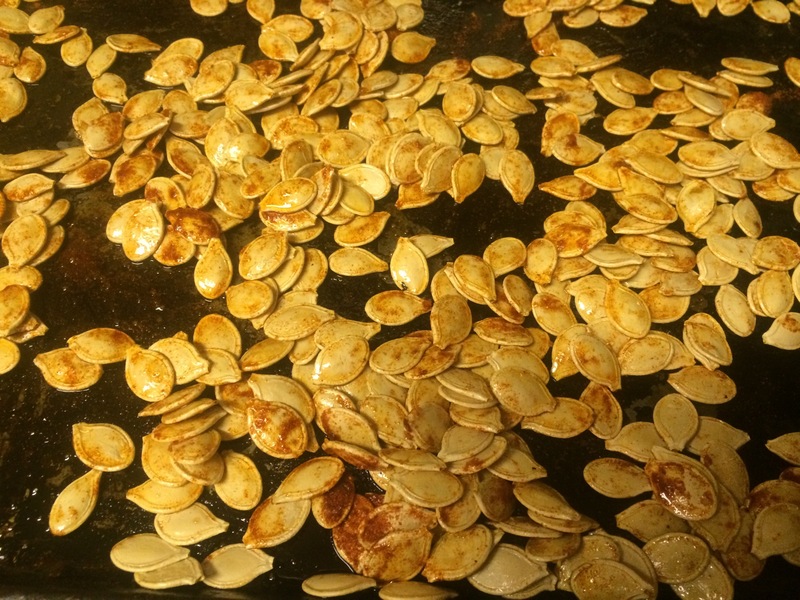 In a separate bowl, whisk together the sugar, pumpkin, oil, egg, and salt. Let dough rest 2-3 minutes. Meanwhile, lightly oil the bowl, put the dough in it and re-cover with the towel. Let dough rise in a warm place until it has tripled in size, 2-3 hours. Punch down dough, knead it a bit more, and cut it into two equal pieces. Cut each of the two pieces into three equal pieces (You should have 6 total pieces at this point). Roll each piece into a straight rope. Braid three ropes together and repeat so that you end up with two braided loaves. For a couple of weeks in June, sour cherries were available at the farmers market and some of the local farm markets. When I saw them, I bought a bunch, pitted them and, since I was not going to use them right away, put them in the freezer. Back to my frozen cherries…I took them out the night before to thaw, and then was ready to make some Albaloo Polo, aka sour cherry rice. I had never had it before, but was quite eager to try some. 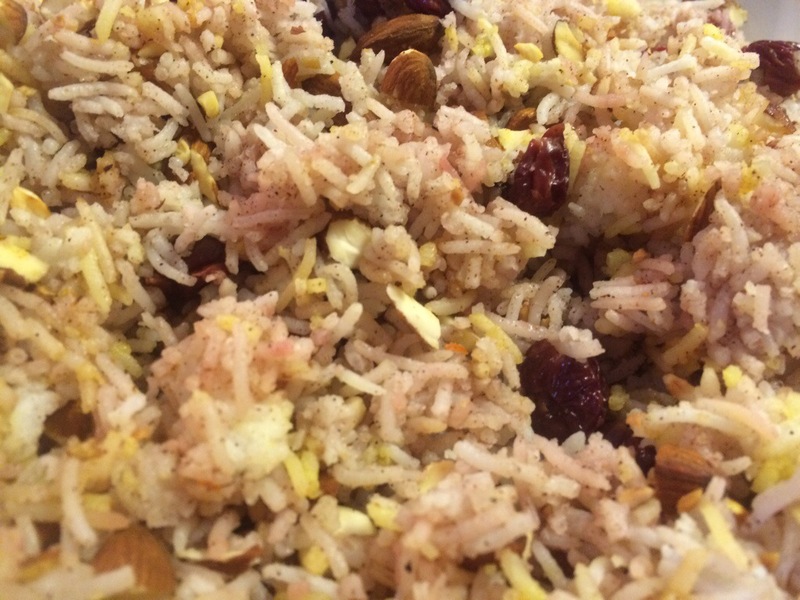 I looked at several recipes, but decided upon Luisa Shafia’s Rice with Sour Cherries and Almonds from her book The New Persian Kitchen. It was very good. 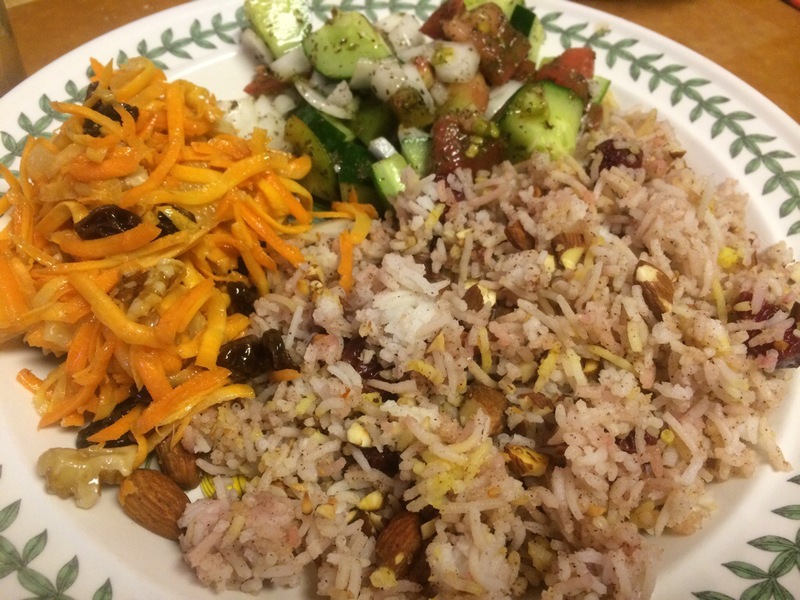 Having never tasted it before, I made it with a couple of different salads – my Carrot Salad and a Persian cucumber-tomato-onion salad with mint and lime juice. After tasting it, I think it would make a perfect side dish with roast chicken. I will consider making it with my Honey Orange Roasted Chicken for Rosh Hashanah next year. I think that would make a very special dinner. As a note – here is a close-up of the salad – the only dressing is crushed dried mint, lime juice, sea salt and freshly ground black pepper. Delicious! Drain the rice and rinse it with cold water until the water runs clear. You want to remove the excess starch. In a pot (6 qt is good) bring the 3 cups of water and a pinch of salt to a boil. Add the rice and return to a boil. Turn down the heat to the lowest level, cover and cook for 20 minutes. Remove from heat and let rest for 5 minutes. Dot with butter and fluff with a fork. 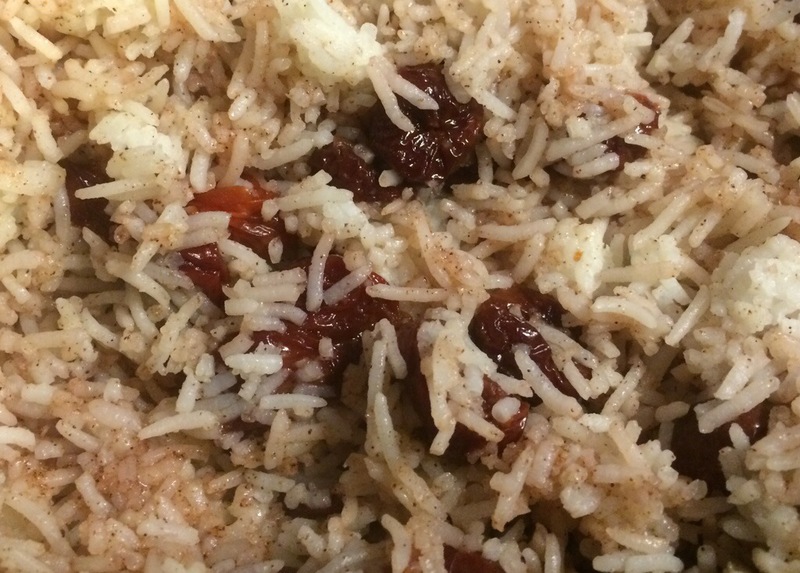 While the rice is cooking, put the cherries in a skillet and bring to a boil over high heat. Turn down the heat to low and add the honey, cinnamon, cardamom, and 1 tsp salt. Simmer for 15 – 20 minutes, or until the cooking liquid is very thick. Spoon the rice into a large bowl. Fold in the cherries and their cooking liquid. 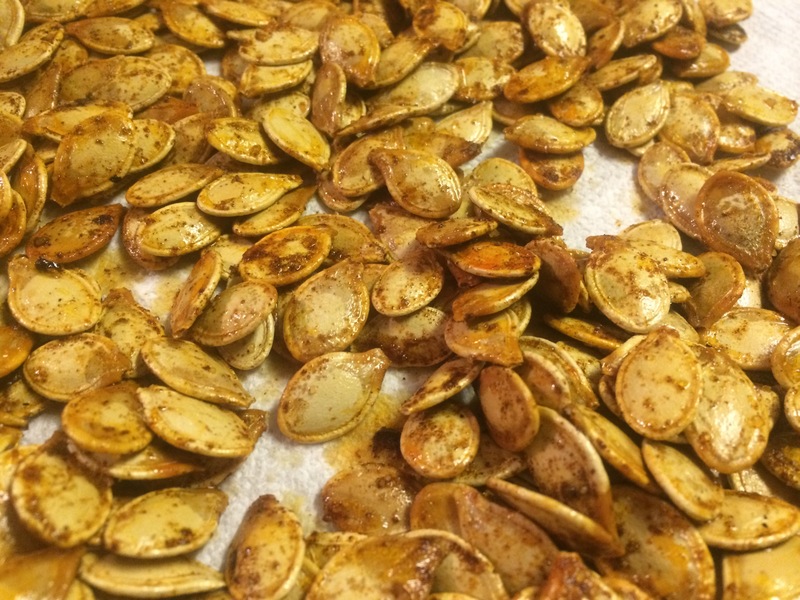 Fold in the almonds and saffron and season with salt. Sweet or Savory? 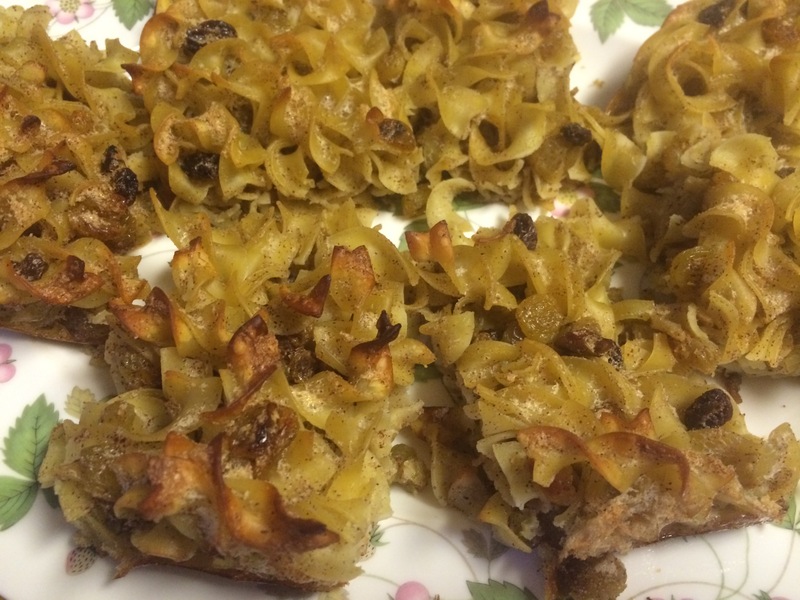 Which kugel should rule? and my mother’s sweet pareve kugel for Yom Kippur. 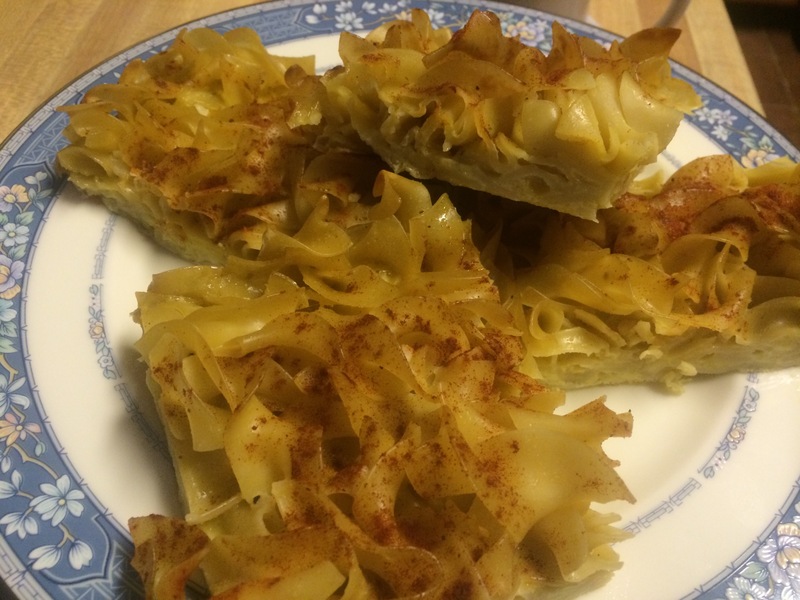 The reviews are in… The savory Salt and Pepper Kugel was a great side dish. It stood up well to foods with bold flavors and sauces. And the paprika on top was a nice touch. 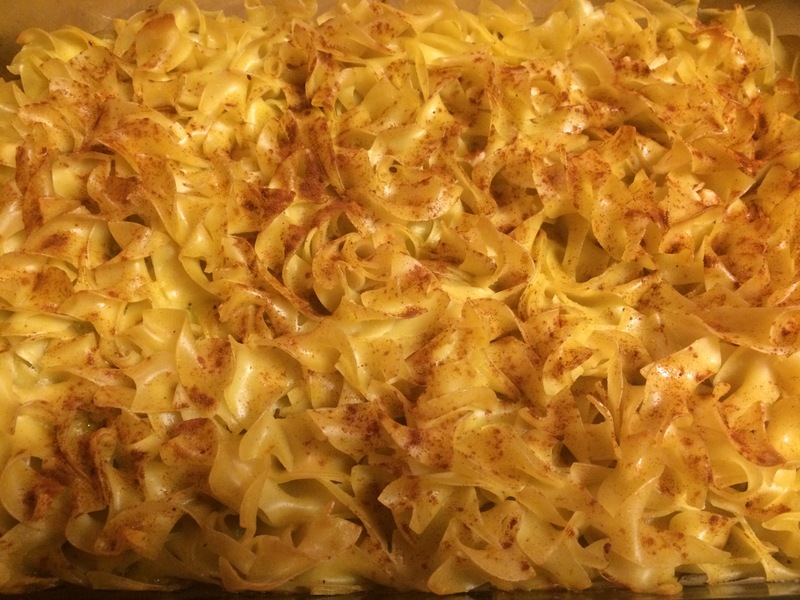 The sweet Mom’s Noodle Kugel was an equal hit, standing up well to brisket and beckoning the next day for lunch. so the winner was…both! Preheat oven to 375 degrees. When oven is heated, add 3-4 heaping Tbsp of olive oil to baking dish and place pan in oven for the oil to heat. This step will make for a crispier kugel. Bring a large pot of salted water to boil. Cook noodles as directed on package, around 7-8 minutes. Drain and set aside. While noodles are cooking, whisk together eggs, garlic, garlic powder, salt and pepper. Add cooked noodles to egg mixture and mix gently until completely coated. Remove baking dish with hot oil from the oven and add noodles to the dish. 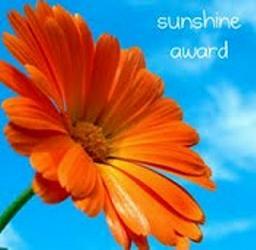 It will sizzle slightly – this is a good thing. Sprinkle top with paprika. Bake for 40 minutes uncovered or until noodles are desired crispiness. Beat egg whites until peaks form. In a large bowl, beat egg yolks, add sugar, spices and raisins, mix well. Drain noodles, add to egg yolk mixture. Fold in egg whites. Transfer to baking dish. Bake for 45 minutes. Cut into squares and serve. Enjoy! Serves 8 – 10.